Rory McIlroy says a European Ryder Cup win at Gleneagles would mean more to him than winning the PGA Tour's £6m FedEx Cup bonus in Atlanta this week. McIlroy, 25, is fourth in the FedEx standings behind Chris Kirk, Billy Horschel and Bubba Watson with victory for any of the top five at the Tour Championship guaranteeing the payout. "I don't play golf for the money any more," he told BBC Radio 5 live. "A Ryder Cup victory would mean a lot more to me." In 2009, a 20-year-old McIlroy called the Ryder Cup an "exhibition" that "in the big scheme of things is not that important an event for me", although he admitted regretting making those comments a year later. The world number one said the FedEx Cup title was also more important than the cash bonus that comes with it. 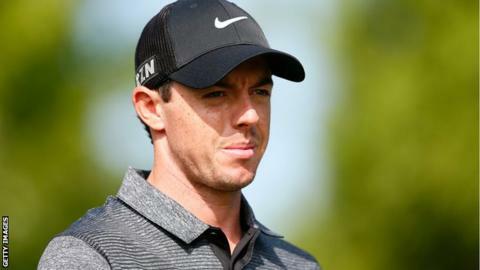 McIlroy has finished 22nd, fifth and eighth in the first three play-offs. He also four-putted the 12th hole in each of the last two rounds at the BMW Championship in Denver last week. "Being in the top five was important coming in, you know what you need to do," McIlroy added. "I would have liked to be a bit higher on the list but haven't played well enough over the past few weeks. "I don't think the money will make me any more nervous on the golf course on Sunday. "But winning the FedEx is one of the only things that I have not achieved in the game of golf and that's the real reason I want to win this week." American Hunter Mahan, who is fifth in the standings, is the last player who can wrap up the FedEx Cup with a win in the fourth and final play-off event, which starts at East Lake on Thursday. In theory, any of the field of 29 - whittled down from 125 in the first play-off event won by Mahan - have the chance to land the overall title. But only those in the top five control their own destiny as they bid to emulate Sweden's Henrik Stenson, who led from start to finish in the play-off battle last year to land the lucrative prize ahead of Tiger Woods.